Credit: Ken Chaney | The Drexel men’s varsity eight boat finished in 4th place out of 37 teams in its division at the 48th annual Head of the Charles Regatta, nine places better than last year’s result. From Oct. 20-21, the two-day event attracted over 300,000 spectators to watch 9,000 athletes compete in a total of 60 events on the Charles River in Boston. The Drexel University men’s and women’s crew teams took a trip to Boston Oct. 20-21 to compete in the most anticipated event of the fall season, the 48th annual Head of the Charles Regatta. Taking place on the Charles River between Cambridge and Boston, the Head of the Charles consists of 60 events and draws over 9,000 athletes and 300,000 spectators every year, making it the largest two-day rowing event in the world. The Head of the Charles is a head race competition, which means that the boats within a given event are staggered onto the course every several seconds and timed from start to finish as opposed to racing simultaneously. The 3.2-mile course, which is known to be exceptionally challenging to navigate, begins at Boston University’s state-of-the-art DeWolfe Boathouse and winds all the way to the finish line between Eliot Bridge, the last of six bridges in the race, and Northeastern University’s Henderson Boathouse. 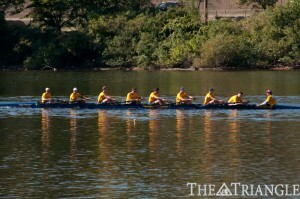 Drexel sent two boats to compete at the prestigious regatta. The women were up first for the Dragons, competing in the extraordinarily competitive Championship Eights division, which included the U.S. women’s gold medal Olympic team, among other strong international and collegiate opponents. Drexel raced well and finished in 18:02.926, which was good for 29th place in the field of 40 teams, two places better than their 31st-place finish in 2011. Two of the 11 teams the Drexel women finished ahead of were the United States Naval Academy, who topped the Dragons last week at the Navy Day Regatta, and a good University of Tennessee squad. The large number of good teams finishing near the back of the field is a testament to the quality of competition Drexel faced. The U.S. women’s national team placed first in the event with a time of 16:13.487. Roughly half an hour after the women’s race began, the Drexel men were at the top of the course, approaching the starting line to compete in the Collegiate Eights division. Going into the race, the men’s goal was to finish in the top half of the 37-team field, which included such teams as the University of Virginia, Bucknell University, Boston College, the University of Notre Dame and Saint Joseph’s University, among others. As Savell described following the race, the Dragons’ pre-race strategy was a “solid plan of building momentum throughout the race by increasing the stroke rating as we progressed through the course. Also, we knew that we had to take advantage of the inside turns when we could.” And Drexel did just that. They were able to execute their plan and efficiently pass crews in front of them. The Dragons swept through the finish line with a time of 15:57.988, which would earn them 4th place in their division. The men’s stellar performance was nine places better than last year’s 13th-place finish and the best in Drexel men’s crew history. Savell was very happy with his team’s success, but he was not the least bit surprised given the overall strength of his team right now. Despite their success in Boston, both teams will quickly refocus for the home stretch of the fall season as they return to the Schuylkill River for the Head of the Schuylkill Regatta Oct. 27.